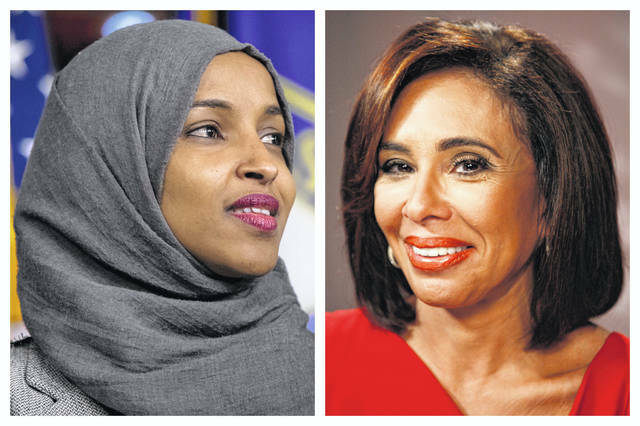 FILE - This combination of 2018 and 2010 file photos shows Rep. Ilhan Omar, D-Minn., left, and Fox News host Jeanine Pirro. On Friday, April 12, 2019, The Associated Press has found that stories circulating on the internet that Omar has filed $100 million lawsuit against Pirro, are untrue. Pirro’s show was absent from Fox News programming for two weeks after her controversial comments about Omar’s religious headwear. It has since returned. THE FACTS: Social media posts falsely assert that the Democratic congresswoman, a Muslim, is suing Pirro, who last month questioned on her show if Omar’s wearing of a hijab is “antithetical to the U.S. Constitution.” No such lawsuit has been filed in any federal court this year, according to public records. Additionally, no lawsuits listing Pirro as a defendant in New York, where Fox News is headquartered, or Omar’s home state of Minnesota have been filed. “This is false,” Jeremy Slevin, a spokesman for Omar, confirmed in an email to The Associated Press. Pirro’s Saturday show “Justice with Judge Jeanine” was absent from Fox News programming for two weeks after her controversial comments about Omar’s religious headwear. It has since returned. CLAIM: Beto O’Rourke’s biggest donor is liberal financier George Soros through the JStreetPAC. THE FACTS: Soros is not O’Rourke’s largest donor, as suggested in Facebook posts that include photos of the men. Soros gave a maximum individual contribution of $2,700 to O’Rourke’s U.S. Senate campaign in 2017, according to campaign finance records. The post wrongly suggests Soros donated $71,885 to the JStreetPAC, a political action committee that directed donors to O’Rourke’s Senate campaign. The JStreet PAC, which supports a two-state solution in Israel, raised a combined $250,196 from individual donors for O’Rourke’s Senate campaign. None of those donors was Soros. The PAC did not directly give any funds give to O’Rourke. Instead, JStreetPAC facilitated individual contributions to him by encouraging its followers to donate to the Democratic candidate on its website and at fundraisers. Soros donates to JStreet, a lobbying arm that is financially separate from JStreetPAC. Fundraising data for O’Rourke’s presidential campaign will not be released until next week, but Soros has not donated to that campaign either through the JStreet PAC, said Ben Shnider, the vice president of political affairs strategy for JStreet. https://www.limaohio.com/wp-content/uploads/sites/54/2019/04/web1_AP19102669015182.jpgFILE - This combination of 2018 and 2010 file photos shows Rep. Ilhan Omar, D-Minn., left, and Fox News host Jeanine Pirro. On Friday, April 12, 2019, The Associated Press has found that stories circulating on the internet that Omar has filed $100 million lawsuit against Pirro, are untrue. Pirro’s show was absent from Fox News programming for two weeks after her controversial comments about Omar’s religious headwear. It has since returned.